The film strips are edible images. The cake is iced in buttercream. The camera is fondant covered styrofoam. All of the other decorations are made of fondant. 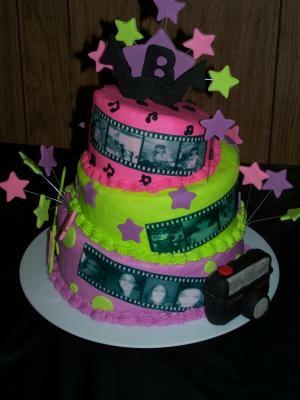 sweet sixteen cake or this movie cake. There are also lots of topsy turvey cakes on the site so make sure you take a look around! A quick and easy way to find most of them all is to just type in "topsy" in the search box at the top of the site and a list will come up. Great cake? How did you attach the stars made with fondant? Is that florist wire? i love this cake... it looks so amazing. I love this birthday cake because it is nice and colorful! You did a great job decorating it - very original.